A man on remand in custody shouted out “I love you” to his girlfriend when he spotted her in the courtroom at Blackpool over a video link hearing from Preston Prison. Matthew Scott, 28, of Milton Avenue, Fleetwood, pleaded not guilty to assaulting a man and fraudulently failing to pay for a taxi journey. Scott did not ask for bail and was remanded in custody towards trial on June 28 by Blackpool magistrates. • A man who denied breaching a restraining order by enter Fleetwood’s Harris Street has appeared at court via video-link. When Gary Atkin was seen by a police patrol he tried to obscure his face as the officers passed him. Atkin, 26, of Ribble Road, Fleetwood, pleaded guilty to taking a car without consent, driving without insurance and not in accordance with his learner’s licence. 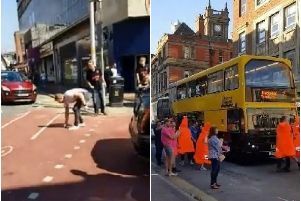 He was sentenced to an eight weeks curfew from 8.30pm to 5.30am, fined £200 with £85 costs, ordered to pay £85 victims’ surcharge and had seven motoring penalty points put in his driving licence by Blackpool magistrates. Police were suspicious and followed him. When he stopped Atkin said the car was owned by his employee who had a garage. He had taken the keys and driven it while his boss was away on a long weekend. Steven Townley, defending, said Atkin’s boss was also his friend and landlord. He had worked with him at the garage for 10 years. • A man with a drink problem stole meat from a store in Fleetwood. Colin Whitmore, unemployed, 42, of North Church Street, Fleetwood, pleaded guilty to theft. He was fined £80 with £85 costs and ordered to pay £30 victims’ surcharge by Blackpool magistrates. Prosecutor, Andrew Robinson, said Whitmore was detained outside Asda, on April 18 at 5.30pm, after being seen taking three joints valued at £27. Patrick Nelligan, defending, said Whitmore, who had had a reliance on alcohol on-and-off for years, had been drinking before stealing the meat. He was now being treated by alcohol specialists and aiming to go into a residential rehabilitation unit. • A Cancer Research shop manager was over the alcohol limit when she hit the kerb and crashed into a hedge. Gillian Murray was described as under stress at the time of the offence from problems in her life. Murray, 50, of North Drive, Cleveleys, pleaded guilty to driving with excess alcohol. She was banned from the road for 14 months, fined £255 with £85 costs and ordered to pay £25 victims’ surcharge by Blackpool magistrates. Prosecutor, Andrew Robinson, said Murray was driving a Peugeot hatchback on Fleetwood Road, Singleton, on May 7 about 7pm, when she lost control of the car, hit a kerb and left the road crashing into a hedgerow. A breath test showed 53 micrograms of alcohol in her body - 35 is the limit. Steven Townley, defending, said his client, who had no previous convictions, had been manager of the Cancer Research shop, Blackburn, at the time of the offence. The shop was being restructured, she had not eaten that day and she was physically and mentally exhausted. She had driven after drinking two glasses of wine. She also had a lot of stress and problems in her life. Her mother had died last year and she was concerned about her father. A friend had also had a heart attack. Christopher Lancaster, 27, of Homestead Drive, Fleetwood, pleaded not guilty to threatening a man with the meat cleaver and possessing the cleaver in public on April 9. Lancaster was bailed to July 28 for trial by District Judge Jeff Brailsford sitting at Blackpool Magistrates’ Court. He must not contact prosecution witnesses or enter Heathfield Road.